Recently, I walked Boston’s neighborhoods: brick and wrought iron, stoops and mansard roofs. 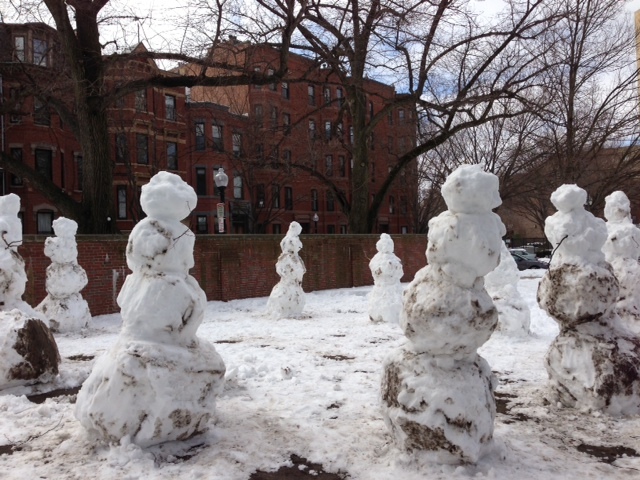 In a park, I came across twelve snow figures, each about eight feet tall. They communed, faceless, in a circle. Nearby was a Methodist church; perhaps the figures were meant to be disciples or choir singers. Or they weren’t meant to be figures at all but an icy Snowhenge. A man walking a poodle stopped to stare. Four young people ran into the circle and mugged for each other’s phone cameras. For the previous two days, snow had fallen steadily outside the windows of the center where I was attending a writing conference. I had been anxious for the snow to stop, so I could get out and walk this city where I had lived twenty years ago as a graduate student. I spent several years writing a novel for my M.F.A. thesis, and between bouts of wrestling with it, I walked and walked Boston’s streets – Back Bay, Beacon Hill, the Fens. I ate slices of pizza in the North End, admired the Fenway Victory Gardens, dreamed about owning a townhouse with a stoop. So when the snow finally stopped falling outside the windows of the conference center, I took a long walk through the South End. The snow figures were in a park named after Titus Sparrow, who, I learned later, was the first African American umpire of the United States Tennis Association. A long-time neighborhood resident, he helped found a club where local children could play tennis. Sparrow had walked these streets, too, and for much longer than I did. He had wrestled with harsher challenges: racism and the evils of Urban Renewal, which almost destroyed his neighborhood. But he made a difference. His legacy is the park with a playground and benches and, of course, a tennis court. A park where an anonymous someone – or someones — rolled twelve fat snowballs into a circle and topped each of them with three more. Six weeks after I returned to Seattle, pressure cooker bombs exploded shrapnel into the legs of runners and spectators at the Boston Marathon. I watched the televised clips of fire flaring, smoke and flags billowing, runners falling, fluorescent-jacketed officials racing in. The curious effect of proximity made this bombing more horrifying than the more numerous ones in plazas around the world where I have never been. I almost felt the shockwave of the blast. And then the suspects were identified. They, too, it turned out, had spent years walking the streets of Boston. Their footsteps crisscrossed my graduate student footsteps, as my footsteps had crisscrossed Sparrow’s. And so do our dreams intertwine and our legacies unfold over the same terrain. The mystery is how contested is that terrain. One man spreads the joy of tennis, while two brothers spread the shrapnel of their pain. Their legacies are as permanent as human legacies ever are: a fence plaque, a park, a thousand scars. The snow figures were never meant to be permanent. Which is why they fascinated me so much. All that effort — twelve towers of snow — for a few days of display. I thought wistfully of my own Sisyphean efforts to write my first novel years ago, and how only a few people ever read it. (My second novel, Half-Moon Scar, did find a publisher and a readership.) When I returned home, I tried to read my M.F.A. novel again, but it just isn’t very good. It’s time for the manuscript to follow the snow into spring’s oblivion. For those scarred by bombs, there is no such option. Someone had the power to hurt them and hurt them deeply, and their flesh will be ever wounded by that legacy. This entry was posted in Uncategorized and tagged Boston, writing. Bookmark the permalink. Complex and moving. I have kindred sentiments–the poem I wrote about Woolwich also reflects on human legacies of different kinds. Yes — so hard to understand the motives. Your poem is moving, too. You should set up a blog! I found this when I searched for “Snowhenge” for a fun snowy picture to post on the Carhenge Facebook page that I run. Would it be all right to share this photo with a link to your blog on the page? Thanks much.